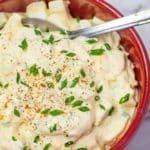 Our Creamy Keto Egg Salad is a classic recipe that we make over and over. It’s an easy, healthy recipe that just about everyone can eat! Fill a saucepan with hot tap water and place over high heat. Gently add the cold eggs. When the water just starts to boil, set your timer for 12 minutes. Once boiled, place your eggs into cool or iced water to chill. Leave for 10 minutes to cool. Peel the cooled eggs and dice before adding to your mixing bowl. Add the remaining ingredients, and stir gently. Taste your mixture and add additional salt and pepper if wanted. Serve straight away or store in an airtight container in the fridge for up to 3 days.